Andrew Liptak over at The Verge has posted a brief video that chronicles the history of art work found on sci-fi comic and paperback book covers in the 20th century. Liptak notes that the fact that the genre was considered pulp – read, “trashy” – throughout most of its early history, ironically enough allowed publishers and artists to enjoy a great deal of creative freedom. Science fiction cover art was originally designed to attract the eye amid a sea of books on a shelf, especially at a time when the genre was demeaned as “sub-literary.” That has become even more important now, in an age where readers select their next reads from tiny thumbnails on retailer websites or via social media posts. As he points, any of us can now own one of these gems from the past for pennies – just go to a local used bookstore, and many of these titles can be had for a dollar or less. The Washington Post has recently published a piece on a new catalogue of UFO literature from the 1940s, 1950s, and 1960s compiled by science fiction writer Jack Womack, entitled …Flying Saucers are Real! I have not yet had a chance to look at the book, but it appears that for those of us who share an interest in the history of the UFO phenomenon, many of the usual canonical suspects appear in the volume. Vincze Miklós at io9 has recently posted some interesting images by Soviet artists showing how they pictured future life in space might be. While space exploration has historically fueled the imagination of artists and writers, it should also be noted that postwar space programs were often beneficiaries of popular cultural and political sentiments. As historian Slava Gerovitch explains in his recent book on the Soviet space program (Soviet Space Mythologies), communist party and state officials and propaganda tended to hail cosmonauts as heroic figures, while also extolling accomplishment in space as the epitome of Soviet science and engineering. The blog RussiaTrek has posted some images of Soviet propaganda posters (see here as well) about the space program that play on some of these very themes. In general, all these images demonstrate that space programs, science fiction, and popular cultural values have historically all had an impact on one another. His paintings, drawings and sculptures dealt, obsessively, with U.F.O.s and their inner workings, often shown in cross section and heavily annotated in Romanian. UFO sightings have inspired not only stories. They also have stirred witnesses and UFO researchers to try to capture the experience in imagery. 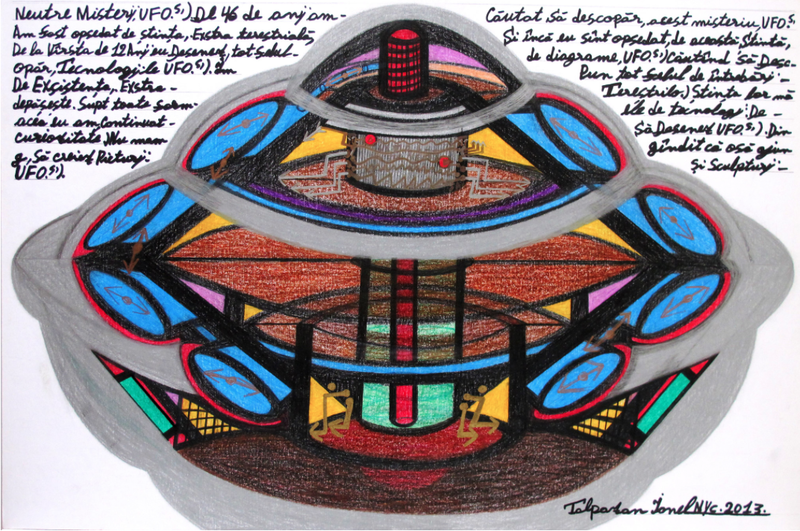 Drawings, paintings, sketches, photographs, and films have all been used as a way to try to better communicate to others the perceived reality of unidentified flying objects and their crews. 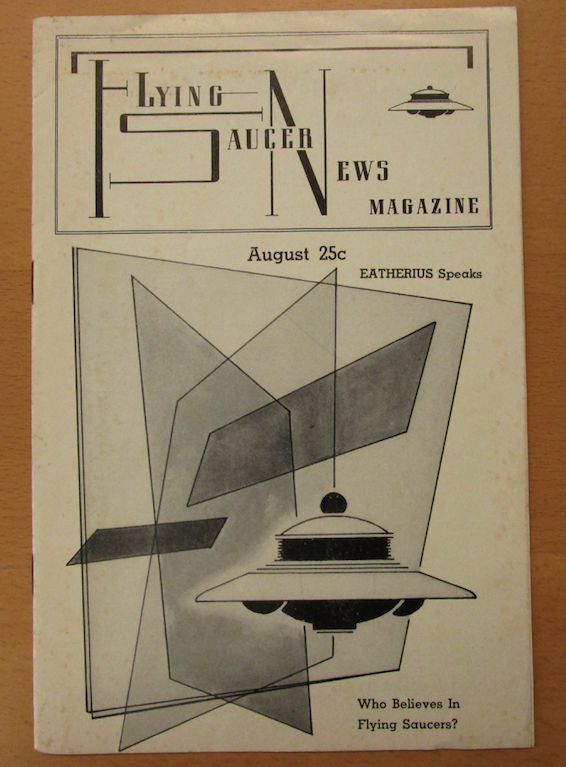 The cover pictured here is from the American magazine Flying Saucer News. First appearing in March 1955, it was published in New York City by James S. Rigberg. Rigberg was the head of the Flying Saucer News Club and ran a bookstore on Third Avenue in New York City for years, specializing in paranormal and new age books and magazines. Rigberg apparently moved the shop at some point to West 45th Street in New York. 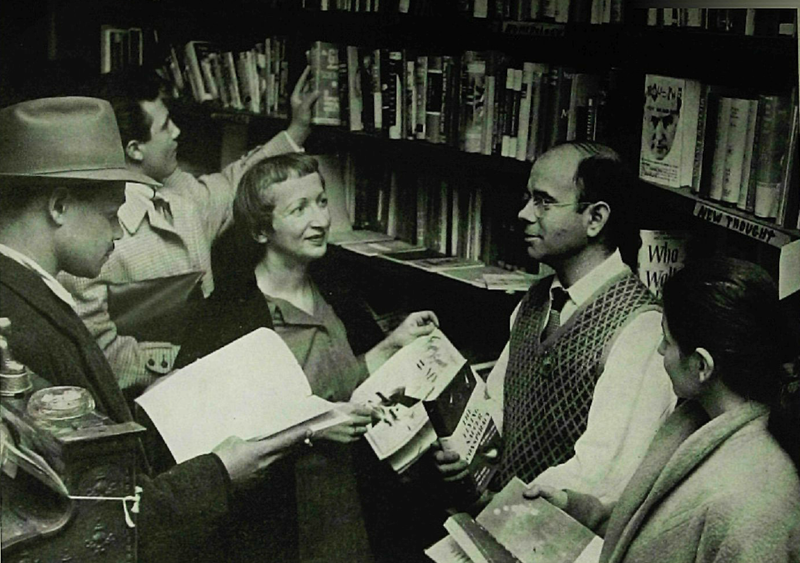 James Rigberg (in sweater and tie to the right) in his bookstore, featured in an article in the Saturday Evening Post in 1956. Image from John Kobler, “He Runs Flying-Saucer Headquarters,” Saturday Evening Post, 10 March 1956. The store was about the size of a shoebox bodega on the street level of a five-story apartment building at 359 West 45th Street. The window display was a low-budget DIY affair—maybe a pie tin spacecraft hanging by a thread and some books. Inside, running along the two longer walls, you would find steel bookcases crammed with UFO, metaphysical, and self-improvement books and magazines. More books were neatly displayed on a table in the center. The space was so tight and the aisles so narrow, that it could only comfortably accommodate about three customers at a time. Usually I would have the entire store to myself. The do-it-yourself ethos described by Augilar is something that has characterized the vast majority of those historically involved in the UFO and alien contact movements. The graphic design here follows a modernist style characteristic of some in the 1950s, with crisp lines and geometric shapes. In the foreground is an image of a flying saucer. But this is not just any flying saucer. 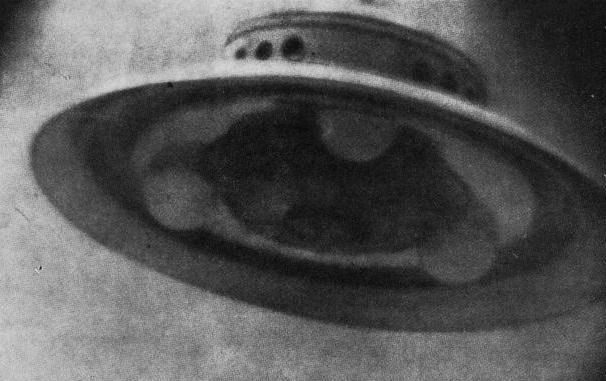 It is clearly supposed to be an example of the flying saucer claimed to have been encountered by George Adamski, easily the most famous – and influential – of those claiming to have made direct contact with extraterrestrials (“contactees”) in the 1950s.